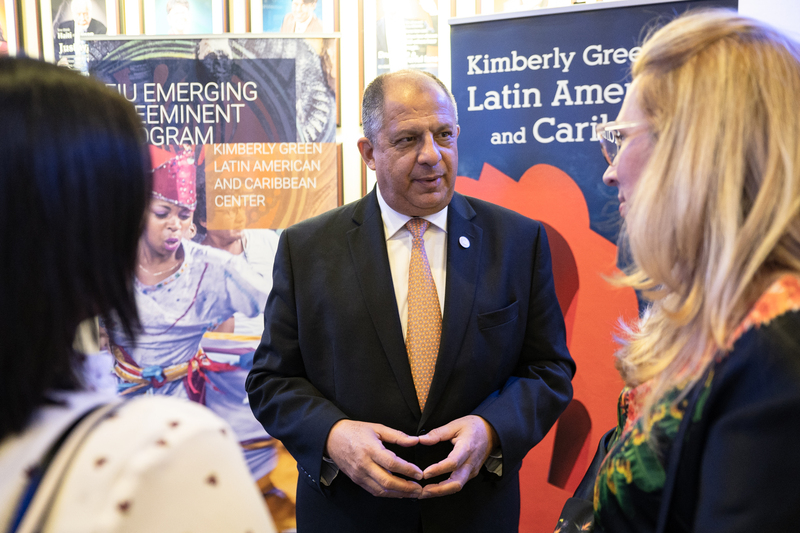 Former President of Costa Rica Luis Guillermo Solís Rivera discussed the future of the Americas at his first presentation as a Distinguished Visiting Scholar at the Kimberly Green Latin American and Caribbean Center. Getting to learn from a professor who is also the former president of a country can sound like a far-fetched dream for students. At FIU, it’s a reality. Luis Guillermo Solís Rivera, who served as president of Costa Rica from 2014 to 2018, has officially begun his appointment as a distinguished visiting scholar at FIU’s Kimberly Green Latin American and Caribbean Center (LACC). To celebrate his arrival, LACC hosted a special conversation with Solís on the future of the Americas as its 2018-2019 LACC Distinguished Lecture. For Solís, coming to FIU is a lot like coming home. Years ago, he served as a researcher and Fulbright Scholar with LACC and also worked with FIU’s Center for the Administration of Justice, both part of the Steven J. Green School of International and Public Affairs. 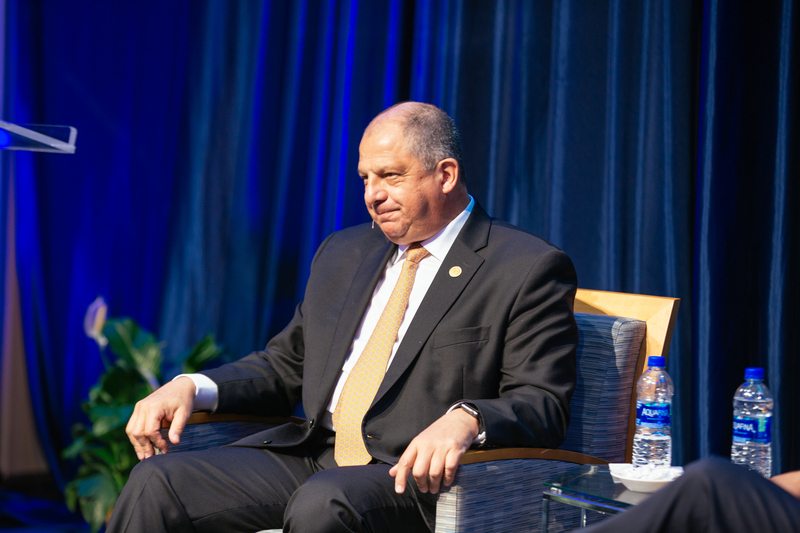 Last year, he visited the university and received FIU’s Presidential Gold Medallion – the highest honor the university bestows upon heads of state and other high-ranking public officials. As a visiting scholar, Solís will lecture on governance and democratic stability in Latin America and the Caribbean, among other topics. During the conversation, Solís explored several key issues impacting the Americas. Topics ranged from economic stability and the impact of the Trump administration on trade relations to natural resources and the threats of violence throughout the region. One surprising issue: The rise of the middle class can bring both positive and negative consequences. Solís said the growth of middle classes across the region is often overwhelmingly beneficial, creating citizens that are generally more educated, less prone to radicalism and violence and more demanding of things like higher quality health, water and housing. Solís said it’s imperative that countries strengthen their middle classes by improving public services and increasing middle classes’ access to financial resources, such as credit to buy houses. 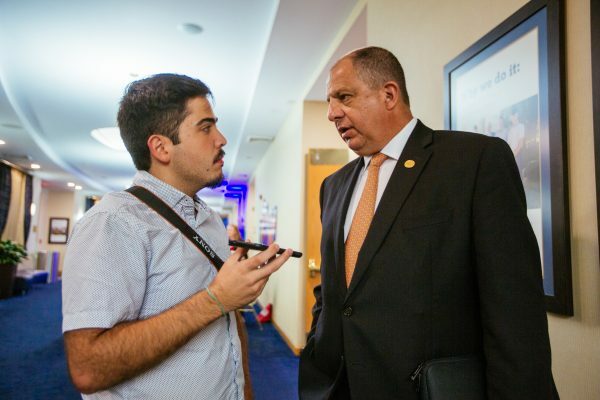 Solís spoke with students, student media and community members at a reception hosted right after his presentation. Another area of concern includes democratic institutions. “The gradual deterioration of the quality and credibility not of democracy, but of democratic governance is a major challenge for the Americas,” Solís said. To those who wonder if democracy has lost relevance, Solis, ascribing to Thomas Jefferson’s view on the matter, said that the problems of democracy need to be solved with more democracy. He also called for increased collaboration and compassion among the countries in the region.